At ToyDemon we try our best to listen to our customers and see if we can always do better. Our survey last month was been a great source of feedback. 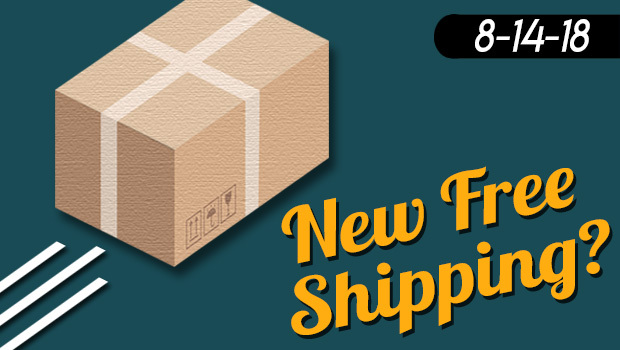 One of the topics that came up a lot from our customers has to do with free shipping and the wish for it to be applied automatically, not having to rely on using a coupon code. We understand that a lot of the things we do, see, and think about are unknown to our customers and we would like to take this opportunity to share some thoughts about shipping. Shipping cost is one of the things we calculate, recalculate, and constantly thinking about what can be done to improve it. Here's a couple of thoughts we have on shipping. In regards to free shipping, quite a few customers commented on the survey that we should provide free shipping at $25 like what Amazon does, better yet 2-Day shipping at $25 applied automatically like Amazon Prime. Our first thought is Amazon Prime costs $119 a year and according to them they are still bleeding money from prime shipping after getting $119. Amazon of course is the #1 Online Retailer in the US (perhaps in the world) with 100-140 warehouse in the US along with their own delivery drivers. We are an ant in comparison doing our best to provide what best Japan and Asia has to offer at a fairly reasonable price and hopefully great customer service to our customers in the US. It is sometimes a little frustrating when customer thinks that what Amazon does should be and can be reproduce at any other level beyond a mega giant corporation. It's impossible for us and/or almost anyone else to match Amazon, especially as we actually let our warehouse workers pee whenever they need, and our CEO is not the richest person in the US. Another thing that most people doesn't know about shipping is that shipping cost keeps increasing year over year just like inflation. A simple google search on Fedex or UPS or USPS rate increase and you will see a lot of results showing the supposed increase. Shipping is only costing us more and more because let's face it, shipping carriers like UPS and FedEx give crazy great rates to companies like Best Buy or Amazon, and must compensate their profits elsewhere. (both UPS and FedEx have had record profits these years) Small business and regular shipper rates are the ones to increase. Don't like it? Well ship at their volumes and we can talk about getting their discounts. We would love to be like Apple and ship you the latest ToysHeart product straight from Tokyo with FedEx International Service for free to you, however, the costs are just way too high. Chances are, it's cheaper for Apple to ship a brand new iPhone to you in California all the way from China, than it is for us to ship a bottle of Meiki Bliss Lotion from us (IL) to a customer in Michigan. Free Shipping is automatically applied at $125. No code necessary. This way, the bigger order will help us offset the free shipping cost and customer that order over $125 can still use a coupon code to get a free gift, or take advantage of sales/promotions that we might have that requires a coupon code. *note just as previous free shipping, pre-order items unfortunately will not count towards the $125 requirement. We know the solution is not perfect for everyone, but we hope by being honest with our customers and explaining our situation, it will help you understand why we do the things we do. Let us know what you think by leaving a comment below or emailing us, thanks!